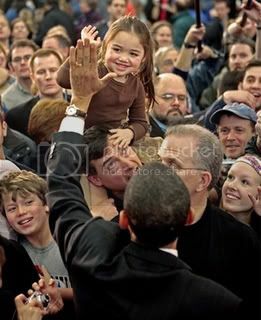 I know the focus of this photo is supposed to be the high five this little girl is sharing with Barack Obama, but all I can see when I look at it is the discomfort she's causing with her other hand. The look on that guy's face? Priceless. That's awesome! The black guy and the chick are sticking it to the white man. Hey this is the girls dad, and I have to say that I was very happy that I was there with my daughter, my face was smiling that the time. I must say this is an awful picture, of me, but my daughter and Barack were almost the most beautiful people there besides my wife.